2019 VBS ROAR! Life is Wild! God is Good! Both the VBS Registration Form and the VBS Photo Release Form must be completed for each child being registered. Return both forms with payment to the Parish Office no later than Friday, May 24th. The fee is $35.00 per child which includes a week of fun, hands on activities at the Imagination Station, fun and games, KidVid cinema and snacks. For more information contact Kim Horn email her by clicking her name below. 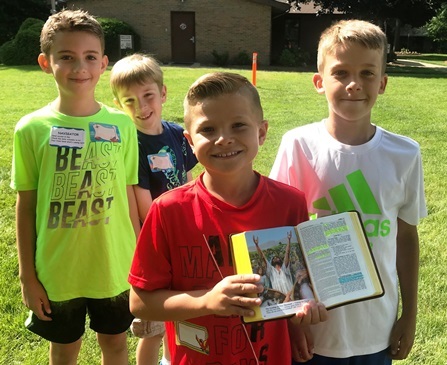 We are looking for adult and high school student volunteers to help us with Vacation Bible School as we travel through an imaginary African adventure to explore God’s love. Volunteers will be needed from June 10-14. High school students will receive community service hours for their participation. You will be working with children who are entering Kindergarten through 4th grade. Positions include leading various activities as well as grade level counselors. For more information or to volunteer, please contact Kim Walczak at 440 376-9783 click here to email her.